On September 10th 2016, Jacob Ezell threw 100 pitches over six innings to defeat the Eastside Diamond Hoppers in a pivotal playoff game. It was his first start since July 8th where he lasted just four innings and gave up four runs on 72 pitches. Ezell was the opening day starter for manager Greg Grall's Utica Unicorns. However, after just seven starts, Grall moved Ezell to the bullpen due to inconsistency and inability pitch deep into games. Ezell's ability to throw six innings and 100 pitches in his final start of the year was a product of a 4-month success story that sheds light on the recovery cycle of a pitcher and how that plays a role on player performance and the decision-making of coaches. We first met Jacob at the 2016 United Shore Professional Baseball League open tryout. He was recently released from the Frontier League and in hopes of a job with the newly formed USPBL. His initial tryout video can be seen below. Ezell displayed one of the most talented arms in his tryout class and was quickly offered a contract to the Utica Unicorns. From the start, he was the unanimous choice to be the Unicorns opening day starter. As protocol with each pitcher who made a team roster, we studied Ezell's shoulder range-of-motion patterns, pitching delivery, and training routines to gain a sense of his current functionality at that time. Two key statistics stood out to us right away; the correlation between Ezell's DVS Score ( 12) and his current level of shoulder function (TAM -9) and the relationship between his velocity (91/93) and his stretch angle (50º). The DVS Score allows us to profile the future health and performance implications surrounding Ezell's pitching delivery. Ezell's DVS Score of 12 signifies each time he throws a baseball he's statistically more at risk compared to the average MLB pitcher. Also, his shoulder function further proved his current pitching delivery was placing more stress on his throwing shoulder as indicated by the 9 degrees of motion deficit in his throwing shoulder compared to his non-throwing shoulder. Ezell's current level of velocity output combined with his stretch angle led us to believe he had the ability to significantly improve his average velocity throughout the duration of the USPBL season. For those of you who are unfamiliar with our stretch angle, a stretch angle is a degree of measurement used to forecast a pitcher's ability to generate more or less velocity based upon their current mechanics. Therefore, by determining Ezell's shoulder was under more stress but was still able to produce a high level of output we concluded that by addressing specific aspects of his delivery and implementing the USPBL Throwing Program, we would gradually influence his rate of recovery and work towards increasing a higher level of performance. In the inaugural game of the United Shore Professional Baseball League, Ezell pitched 4 innings, gave up 1 run, 1 hit, 1 walk, and struck out 6 hitters. Impressive stat line to begin the season but what the box score doesn't indicate is the gradual velocity drop once Ezell approached 50 pitches in the third inning, and a significant decrease in the 4th inning. Ezell was on a pitch count to start the season ( max 75 pitches) but seemed noticeably fatigued around 50+ pitches. I positioned myself directly behind home plate for his first start; wanting to track the flight and action of his pitches. As he began to approach 50 pitches, you could see a noticeable change in Ezell's fastball starting to run out of the zone and consistently fall behind hitters. Ezell battled, made some big pitches, but from a scouting perspective, was a much different pitcher in the 3rd and 4th inning comparatively to the 1st and 2nd. Jacob Ezell's early season pitching delivery seen from a side camera angle. Jacob Ezell's early season pitching delivery seen from a back camera angle. We were curious to see the role 60 high-intensity pitches placed on the recovery cycle of Ezell's shoulder and elbow. As with all pitchers in the USPBL, we tracked their shoulder ROM patterns on a daily basis. In particular, we specifically wanted to focus on the degrees of shoulder motion lost after a pitcher has thrown in a game situation. In Ezell's case, he started the game with 162º of motion in his throwing shoulder with a 5º deficit in his throwing shoulder compared to this non-throwing shoulder. Immediately after his start, we found he had 158º of motion in his throwing shoulder and an 11º deficit in his throwing shoulder compared to his non-throwing shoulder. In the days following his start, Ezell experienced prolonged pain and soreness in his throwing arm. "At the beginning of the season when I was starting I was sore almost till the day before each start so about 4 days" Ezell stated. When asked "did you typically throw through soreness"? He responded, "I would throw through soreness, but it wasn't anything too strenuous that I wasn't able to throw with, I knew my body and arm." Far too common in the culture of pitching, pitchers and coaches make the mistake of thinking you must throw through soreness to speed up recovery and get your arm loose again. When a muscle is sore, it most likely has undergone some form of damage, which is going to decrease its ability to produce force. This scenario means that the excess stress from throwing will be transferred to other tissues in the body that aren't equipped to handle it. For the muscle to regain its full strength and function, proper recovery time is a must. Therefore, in the meantime, it's important for a pitcher to scale their throwing regimen to avoid further injury, and expedite the recovery process. Based on the protocols within the USPBL Throwing Program and Ezell's soreness levels, he didn't throw a baseball until 4 days after his first start. Typically a starting pitcher throwing more than 50+ pitches should be relieved of all acute arm soreness 48 hours after a game. Ezell, through the first two weeks, often wasn't entirely relieved of arm soreness until after 72 hours post game. Image 1: As a product of the DVS System and creating better timing in his delivery, Ezell placed less stress on his throwing arm and was able to maintain greater functionality and therefore greater range of motion in his throwing shoulder 24 hours after a game. The cycle of inconsistency continued throughout Ezell's next start, and so did his slow recovery period. We began to infuse the DVS Arm Care System into his daily regimen which accounted for a significant portion of his routine due to his limited throwing set forth by his soreness protocols. However, since his actual throwing was limited post game, we also begin a gradual process to align Ezell's shoulder's and pelvis better as he initially began his pitching delivery. The transition can be seen in the image to the right. Ezell's front shoulder had a tendency to dip forward as he broke his hands which ultimately led to his throwing arm catching up late as his front foot made contact with the ground. We know that improving the arm position at foot strike can have many benefits most importantly on the ability of the shoulder to tolerate more stress as the throwing arm accelerates forward. With an improved arm position we hoped to accomplish two primary goals; a faster rate of recovery for the throwing arm and improved performance in games. It's often difficult to make adjustments to the pitching delivery in a season, especially if the movement disrupts a timing pattern that has existed within the delivery for an extended duration. However, Ezell's adjustment was simplistic and made possible in a short period due to his understanding of what he needed his body to do. Over the next few weeks, Ezell saw improved shoulder function as a product of using the DVS Arm Care System, The USPBL Throwing Program, and minor mechanical adjustments. If you look at the table below, you can see his DTAM (total motion in throwing arm) gradually improved over the course of June and into July. " "The bands we did with DVS helped me quite a bit with recovery. I started throwing less, throwing about 90-120 feet and worked on stuff and just do my bands. It kept my arm from getting fatigued and just kept me fresh all season." said Ezell on alleviating soreness. As the weeks progressed, the improved shoulder patterns remained stable and consistently improved over 10º (158º to 176º) in a 5 week period. With the improved total motion in Ezell's shoulder, the recovery time began to shorten from 72 hours to 48 hours as Ezell entered into July. Although Ezell was improving the health of his throwing arm throughout June, his performance remained irregular; forcing manager Greg Grall to make a decision on his role as a starter. "He would just get to a certain point in the game where his velocity and location would dip. He was more of a max effort type guy, and we knew if we put him in the bullpen we could possibly use him as a closer or a guy to come in and pitch multiple innings. Overall, we just thought he would be more consistent out of the bullpen", said Grall. Ezell officially became a reliever after his start on July 8th. We gave him a week off to continue to work on his pitching delivery and prepare a new throwing regimen that would prepare him for his role as a reliever. His improved recovery cycle indicated he would be capable of throwing every other game if need be. All factors considered Grall opted for Ezell to be his primary reliever out of the bullpen in late-inning situations. Although the box score may not reflect his improvements, we began to see a slight increase in Ezell's strike percentage, velocity, and action on his fastball and slider. During this period, and like most starters who move to the bullpen, Ezell's average fastball velocity climbed from 91.6mph to 92.5 mph. With the addition of velocity (Table 5) and improved arm position (image 1) his fastball started to show signs of a more downward sinking action. With Ezell now throwing more frequently out of the bullpen, the opportunity created time for him to solidify his mechanical adjustments and comfort level in game situations. As July ended and August began, Ezell positioned himself to finish the season in a more consistent manner. For the remainder of the season, Jacob Ezell turned into arguably the most consistent and reliable pitcher in the USPBL. From August 3rd to September 3rd, he had appeared in 11 games, pitched 12 innings, and didn't allow a run. The best part; he seemed to be getting stronger as the season wore on. His arm recovered faster, his fastball velocity increased, his strike percentage increased, and perhaps most important he became confident in his ability to get hitters out. The video seen below highlights the mechanical pattern of Ezell's delivery on August 31st. In stark contrast his initial evaluation, you will notice the dramatic difference between the position of Ezell's shoulders as he breaks his hands and begins his movement towards the target. 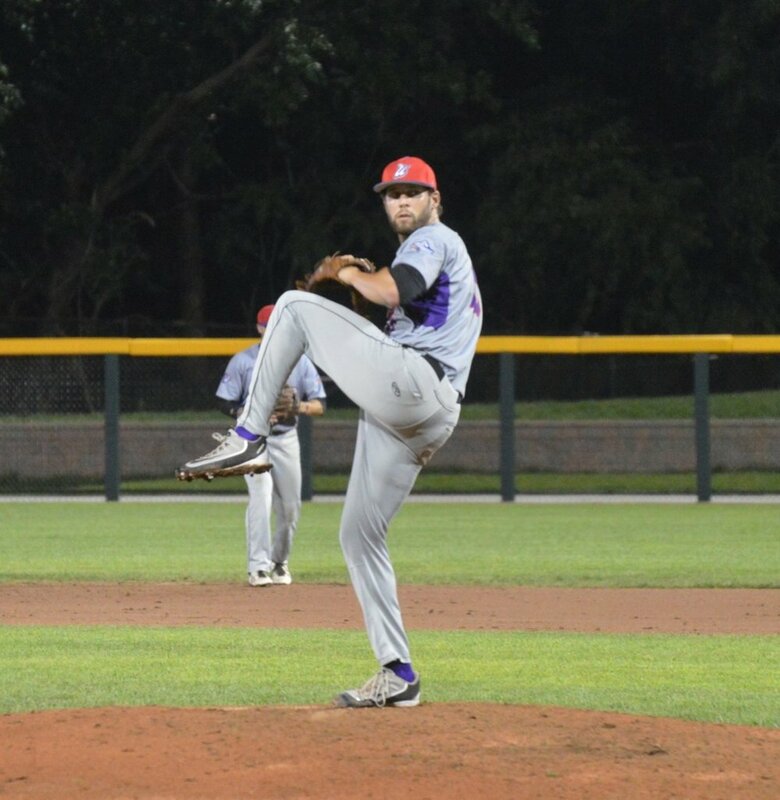 As the playoffs approached, the Utica Unicorns became loaded with dominant arms coming out of the bullpen. Joining Ezell, the Unicorns featured Andrew Potter and Mitch Aker; two right-handed pitchers featuring 95+ mph fastballs and nasty sliders. Once Ezell was pulled from the starting rotation in July, Seth Brenner became one of the most valued starting pitchers on the Unicorn staff. But as the season wound down, Brenner showed signs of fatigue and inconsistency heading into the final two weeks of the regular season. In the first round of the playoffs, Grall made the gutsy decision to start Ezell. "Brenner was tired. The wear of tear of starting had caught up to him. We had been keeping a tight schedule on Ezell. Making sure he got his innings every other game. When it came down to it, we knew Ezell had started and with his improved confidence and stuff, we had to go with Ezell in the playoff game." Grall said. In his last start and final appearance of the year, Jacob Ezell ended up throwing more innings, pitches, and had his best outing of the year. His efforts propelled the Utica Unicorns into the championship game which they eventually won. The pitcher that took the mound on May 30th had now proven he could pitch well past 50 pitches, recover quickly, and started to show signs of being able to pitch at the next level. The scope of Ezell's improvement over the last six weeks is remarkable and one of the greatest success stories that transpired during the 2016 USPBL season. One of the most significant values of the USPBL is Ezell was able to fail and struggle because of the league's commitment to his overall development. A plan was laid out for him in June, and as each day progressed, Ezell was making strides. " I learned how I could do a little less of the heavy weights and long toss and actually keep a healthier, stronger and more flexible arm. Also, the way they help me tweak some of my delivery, helped me become a more consistent pitcher. Helping me stay tall, stay back, getting my elbow up helped my overall command with every pitch a lot better. With those tweaks my average velocity increased and put less stress on my elbow and arm." says Ezell. I don't think anyone expected him to finish as strong as he did, but you never know what a player is capable of until he's able to utilize the full spectrum of his talents. Shortened recovery window from 72 hours to 36 hours. The improvements mentioned above can be made possible for a majority of players at all levels; most importantly the players that are trying to get signed to an affiliated club. But a pitcher must understand Ezell's route to his eventual success was only made possible by the order in which we focused his development. If you want to continual success, there is no quick fix. You must be willing to understand the full spectrum of your development. "Focus on mechanical efficiency, repeatability, and joint health, and as a product of those, you will find confidence, velocity, and success."